A family member or friend has just announced they are expecting a baby! A baby shower is soon approaching, and you want to get something that shows you care, but oftentimes baby shower gifts can be rather pricey. Oftentimes people overspend on baby shower gifts, but it doesn’t have to happen to you-here are five baby shower gifts you can get for under forty dollars. Babies, as we all know, are equally as messy as they are cute. Simply leaving them with some baby food spells a kitchen disaster, with food all over the place! With ImseVimse’s cute bandana-style bib, baby can make as big as a mess as they want, without having to make mom clean everywhere. Adjustable popper fastening and a variety of colors and patterns make this bib perfect! The set also includes a 100% cotton swaddling blanket-great for keeping baby warm and can be used in so many ways. Not to mention that the set is wallet-friendly, at only thirty dollars. The set is a great gift to make any expecting parents and their baby happy. Dirt, spit, and food are just some of the things that will be discovered at bathtime. Sensitive skin and eyes make gentle shampoos and soaps necessary for scrubbing the daily grime off baby. Earth Mama’s kit includes lotion, oil, and bottom balm for post-bath skin care in addition to shampoo and body wash. Gentle and all-natural, health-conscious parents will be delighted when they see you got them this set, and it’s less than twenty dollars! Looking for something unique and functional as a baby shower gift? 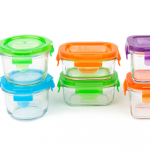 Look no further with Wean Green’s glass storage containers-excellent for storing snacks, baby food, and anything else you can think of! Durable and compact, these containers have dozens of uses, and at only thirty dollars, they are an awesome way to help parents and baby be more organized. 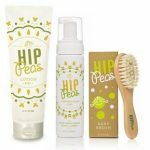 Baby’s hair is soft and fragile, Hip Peas’ baby wash and wooden brush help keep it healthy and clean. The wash is foaming, non-toxic, and has no artificial colors. The wooden brush is eco-friendly and cruelty free, with soft bristles to keep those wispy heads of hair in place. The set also comes with a moisturizing lotion that’s hypoallergenic for the most sensitive of skins. An excellent gift for sensitive little babies! Tears and restlessness come just as much with a baby as does the laughter and cuteness. Long nights where baby just cannot rest plague parents everywhere. Earth Mama’s Sleepy Little One Gift Set is awesome at helping alleviating this. The set includes body wash, lip balm, lotion, and a cute heart plush. All of these products include the natural calming properties of lavender, perfect for helping clean and care for baby while keeping them happy. The parents will thank you after receiving this super-helpful set and your budget will thank you too, at forty dollars, this kit is a fantastic gift for any baby shower. Any of these gifts are an affordable, quality way to help expecting parents introduce their bundle of joy into the world! 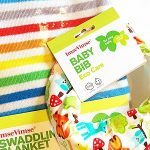 This entry was posted in Blog and tagged baby shower gifts, earth mama angel baby, green team reviews, imse vimse, wean green. Bookmark the permalink.